The Western South Dakota Catholic Foundation was created to insure the financial stability of ministries within the Diocese of Rapid City. It was established on December 30, 1992. At the time of incorporation, Grant Trotter, Stewardship Director, was named executive director and Linda Batman assisted him. The mission of the foundation was established as promoting and strengthening the Catholic Church by providing people an opportunity to contribute to a permanent endowment fund, and make other types of gifts that will provide financial resources for meeting the spiritual needs of future generations of Catholics in the diocese. The foundation is primarily the project of laity and it was encouraged by then­Bishop Charles J. Chaput. Among the steps in establishing the foundation was the lengthy process of writing a constitution and by-laws that would govern the organization. A silent fundraising phase was immediately started by the newly formed organization with an original goal of $4 million. Msgr. Michael Woster, serving as Diocesan Administrator at the time, continued with the silent phase with the help of foundation leadership, after Bishop Chaput was appointed Archbishop of Denver in 1997. President Ray Hilenbrand, with the support of Pat Goetzinger and Harvey Krautchun, conducted estate planning seminars and promoted the purpose of the foundation throughout the diocese. A significant portion of the original $4 million goal was raised between 1992 and 1998. When Blase J. Cupich was ordained Bishop of Rapid City in September of 1998, the foundation began their campaign titled “Endowment 2000.” The initial strategy was to raise the remainder of the $4 million in five-year pledges. In December 1998, the newly ordained bishop said everyone contributing to the growth of the WSDCF should consider themselves “new founders of the future” of the church in the Diocese of Rapid City. “In working toward self-sufficiency for the ministries in the diocese, I sense that, people are willing to change their viewpoint from being a mission diocese, to a diocese with a mission,” he said. Harvey Krautschun of Spearfish was the chairman of Endowment 2000. He was also elected the treasurer of the WSDCF board. At that time he said, “Foundations intrigue me, especially this one, because it reflects my spiritual beliefs. All too often people have the perception foundation work is driven by dollars. The reality is the opposite; what drives foundations and endowments is a common belief in our spirituality and our humanity as they come together; we can do more by uniting than by standing alone. With the set goal of $4 million, in February 2000, the Endowment 2000 campaign became a parish drive encouraging all families to participate. Parishioners were told only the interest earned from investing the core money would be used to support the diocese and religious education and youth ministries were added to the list of recipients. By March 2000, $3.5 million had been raised. As the fund grew, people began donating money for specific causes; those donations did not become part of the core investment and were dispersed according to the wishes of the donors. At that time, Trotter, said, “A number of people have told me they would like to give to Endowment 2000, but are not able to make the kind of gift necessary for the Foundation to reach its goals. They feel they are not able to make a “large enough” gift …” Recalling the widow’s mite, he went on to say the fund had received gifts ranging from 85 cents up to $500,000. In March 2001 Dwight Sobczak took over as president. In September that year, Bob Bickett became the executive director. In December the new executive director and foundation members launched a series of diocesan-wide meetings to raise awareness about the foundation and planned giving. In 2002, Shirley Stec and Dan Corrin from Stec’s Advertising Specialties designed a logo, which is still in use. Also in 2002, a Catholic Heritage Society was formed to recognize people who made deferred gifts to the foundation. A fund was established for monthly Masses to be celebrated at various locations, to remember the society’s members. Around that same time the foundation began sponsoring a donor reception after the annual Chrism Mass. The Mass is held at the same time as Pastoral Ministry Days and it attracts many people from outside Rapid City. The reception is a way to thank the donors. In 2006, Doris Bride became the new assistant to Executive Director Bickett. Bishop Cupich was appointed Bishop of Spokane, Washington in 2010 and Bishop Robert Gruss was ordained for the Diocese of Rapid City in 2011. In 2013 Tim Henderson took over as executive director and in 2016 Elizabeth Siemieniak became the assistant. They are the current WSDCF staff. Many other fundraising events have been strategized over the years. In 2001, the foundation hosted a Pheasant Hunt for Seminarians. The latest hunt was held October 3-4. In 2011 a fishing tournament was held at Ft. Pierre to benefit the people impacted by Missouri River flooding. In 2012 it evolved into the Bishop’s Fishing Tournament for Seminarian Education. It has been held in four of the past five years. In 2014 a Bishop’s Golf Classic was added to the fund raising events. It is held in conjunction with the Catholic Social Services and the Rapid City Catholic School System. This year the fourth annual golf tournament was held August 14, netting the three entities more than $30,000. Sobczak stepped down in 2015 and Msgr. Woster of Spearfish became president. Tony Berendse, Rapid City, is currently serving as the foundation’s vice president. They, along with the executive director, are leading the WSDCF Board of Directors through a re-envisioning exercise to develop strategic approaches for improving the structure of the organization, set short and long-term goals, and implement actions that will guide the Foundation for the next 5-10 years. As of June 30, 2017, the total WSDCF fund balance is $20,148,771, and unrestricted funds totaled $6,449,204. During the past 25 years the WSDCF has given out $9,288,131 to the diocese, parishes and Catholic organizations. To find out more about the foundation contact: WSDCF Executive Director Tim Henderson, PO Box 678 Rapid City, SD 57709, phone 605-343-3541 or email THenderson@diorc.org. bishops of South Dakota on issues of public policy, providing explanations of church teaching and their practical applications. He will follow the development and implementation of public policies and communicate with officials at all levels of the government. Christopher Motz is in the initial stages of opening the first South Dakota Catholic Conference Office in Sioux Falls. 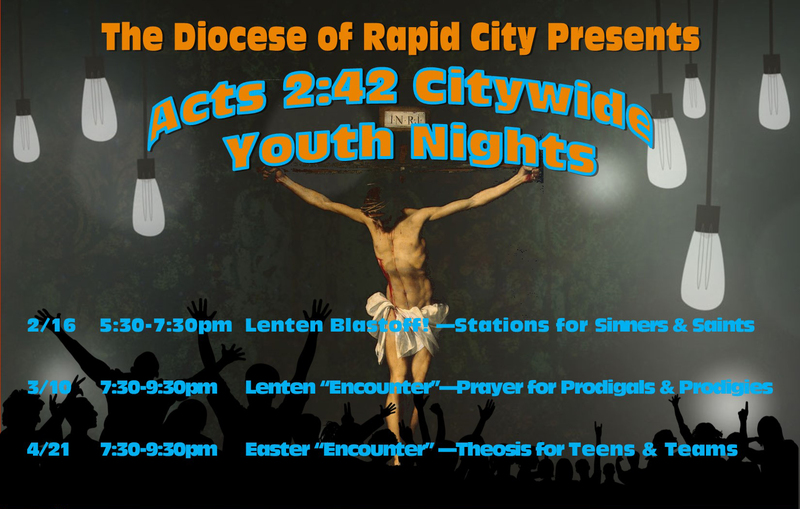 It is jointly sponsored by the Dioceses of Sioux Falls and Rapid City. He has joined the National Association of State Catholic Conference Directors, which has members from 40 states. His first meeting will be Nov. 29 to Dec. 2 in Washington, DC, at United States Catholic Conference of Bishops headquarters. “While I am out there I will also take the opportunity to introduce myself to the S.D. congressional delegation,” said Motz. He said his job will have internal and external components. Externally he is focused on keeping Bishops Paul J. Swain and Robert D. Gruss informed on current judicial, executive and administrative actions. In addition, he will apprise the bishops of lower level court decisions in cases working up through the appellate process that may eventually have an impact at a broader level. “Internally, it is important that the Catholic lay people are informed and have a grasp of what the church teaches and believes not only for their own understanding, but also so they might be able to articulate it to their friends and neighbors,” said Motz. An example of an important issue is the physician assisted suicide initiative which failed to garner enough signatures to be on the 2018 state ballot. “It will come again and education will continue to be important,” he said. The upcoming 93rd South Dakota Legislative Session, which opens Jan. 2, 2018, will be his first opportunity to work with S. D. lawmakers. In the future he sees himself being available to give presentations to parishes and on college campuses. He can be reached at: Christopher J. Motz, Executive Director South Dakota Catholic Conference, 523 North Duluth Ave., Sioux Falls, SD 57104. There are 22 counties in western South Dakota and 21 of them don’t have enough mental health providers to meet the needs of their residents. Thanks to a new telehealth initiative from Catholic Social Services, access to a licensed, professional counselor may soon be only a computer screen away in those counties. Telehealth technology can provide outpatient therapy and other behavioral health services delivered electronically by a counselor in Rapid City to a client who is accessing the appointment via computer, cell phone or other mobile device at a remote location. Telehealth is an innovative way to help solve the problem of limited access to mental health care that exists in western South Dakota, Larsen said. Two at-risk populations who stand to benefit from telehealth services are middle-age white males living in rural regions and young Native Americans. In South Dakota, these groups are among the high risk populations for suicide and have experienced record numbers of losses to suicide in the past three years, according to the S.D. Department of Health’s 2017 Suicide Surveillance Survey. “This initiative will allow us to more effectively reach out to those groups using telecommunications technology and help two of the most underserved areas in our state: Native American reservations and rural ranching communities,” said Jim Kinyon, executive director of CSS. In the western half of the state, only Pennington County, where CSS’s main Rapid City office is located, has sufficient mental health professionals to meet demand for services. CSS also staffs satellite offices part-time in Sturgis and Spearfish, and in the more remote communities of Pine Ridge, Porcupine and Eagle Butte. On the Cheyenne River Reservation, where a CSS counselor works two days per week, the ratio is 1 mental health providers for every 2,840 residents. “While Catholic Social Services would love to extend face-to-face services everywhere, the reality is that given many of the remote regions of our diocese this is not feasible. However, through telehealth, we reduce the windshield time and travel expenses and this improves access for those needing services,” Kinyon said. Telehealth counseling costs are being supported by a two-year, $50,000 grant from Catholic Extension. This strategic initiative funding is designed to improve health ministry in the Diocese of Rapid City and other mission dioceses in the U.S. CSS is working with numerous parishes across the diocese that will serve as locations for anyone who wants to access telehealth services from the agency but may lack the technology or high-quality internet connection in their home that it requires. To learn more about telehealth services or to schedule a counseling appointment, contact CSS at 605-348-6086. Mission driven or maintenance driven? This is an important question for all of us. In other words, do we keep doing what we have always done and in the way we have always done it? Or do we step out in faith allowing Jesus to stretch us as we embrace life as his disciple, his living witness in the world? Our Diocesan Priority Plan points our way as we “carry forward the work of Christ under the lead of the befriending Spirit.” As we all know, essential resources are needed to allow the Diocese of Rapid City to be mission driven rather than maintenance driven. Some of these resources come from the Annual Diocesan Appeal. The 2018 Annual Diocesan Appeal took place the weekend of November 18-19 with an in-pew solicitation, asking you to give generously. This year’s theme is “ … who else will give? . . .The people rejoiced … for they had given to the Lord wholeheartedly” (1 Chronicles 29:5,9). This is an invitation for every Catholic family across the diocese to prayerfully consider what the Lord is asking of them. When we reflect upon what the Lord has done for us, we realize that he will never be outdone in generosity. And when we give to the Lord wholeheartedly, we imitate his generosity to us. This year’s annual appeal goal of $1,491,000 represents approximately 37.6 percent of the total diocesan budget. The remainder comes from outside granting sources and other revenues. This is why your support is invaluable for us to carry forward the mission of Jesus Christ. We really do want to live as disciples of Jesus with hearts that are “mission driven.” This is the call of the Gospel! Over the last many years, three of ten families share a gift in the annual appeal. Imagine what could happen if more Catholic families partnered with us in the mission of Jesus! Imagine if this number increased to 40, 50, 70, 80 percent participation! All families are invited to participate. Some families may feel they are not able to give, but I believe that most all families can find a way to participate in some way. All gifts, large or small, make a difference and touch the lives of the people we serve throughout the diocese. Generous disciples are never afraid of running out or fearful of not having enough. They live in faith, gratitude and — trusting that God will always provide. Generous disciples realize that God feels responsible for us, even though we are sinners; that God will never be outdone in generosity; that God has invited each of us into his way of life, into his way of being, into his way of generosity. When we live God’s way of life, we live in the very image of God himself, in whom we have been created. We look and act just like God. In other words, we view and live life through the lens of abundance instead of scarcity, a lens of provider instead of provision, a lens of gracious giving instead of fearful giving. We experience God as giving, the moment our hearts say “yes” to Gods desire for relationship with us, giving abundantly to us, endlessly pouring out in His gifts a love greater than our hearts can fathom. The Annual Diocesan Appeal is an important way in which every Catholic family can serve one another sacrificially, thereby helping to build up the body of Christ in western South Dakota. Your sacrificial support is important to us, deeply valued and necessary for us to love as mission driven people. The Lord has given us all different gifts, but calls each of us to the same sacrifice. This is why the heart of stewardship is spiritual. At the end of October, Jesuit Father Jim Kubicki, president of St. Francis Mission, led the chancery staff retreat. In the talks he shared with us, he focused on the diocesan vision statement: Reconcile — Make Disciples — Live the Mission. These six words are the foundation stones, the building blocks that will help to move our diocese in a new direction, helping us to reorient our lives to be reconciling disciples. Father Kubicki said “the heart of the Gospel is reconciliation itself.” In 2 Corinthians 5:18, we hear that Christ was sent by the Father to reconcile us to him, and so now Christ gives us the ministry of reconciliation. We are called to be a reconciling people, to not only extend forgiveness to one another, but also to receive forgiveness from others and to learn to forgive ourselves in and through Christ. To help us live out this vision of reconciliation in our parishes and diocese, we are called as parish communities to identify areas where reconciliation and unity are strong and areas where reconciliation is needed. Also, each parish or group of parishes were asked to submit to Bishop Gruss a plan which engages and promotes reconciliation and includes an implementation process that will help us live intentionally in the heart of the Gospel as Jesus did. In October, the priests of our diocese were on retreat at Terra Sancta. Our director was Jesuit Father John Horn. He is the co-founder of the Institute of Priestly Formation at Creighton University in Omaha, and currently serves as professor of spiritual theology and spiritual director at St. Vincent de Paul Regional Seminary in Florida. Father Horn, like Father Kubicki, focused the priest retreat on the theme of reconciliation. One of the things Father Horn shared with us was a new guide for confession and receiving God’s mercy. As we approach Advent, we will have a number of opportunities in our parishes to ask, to receive, to grant forgiveness in and through Christ and to be those reconciling disciples that we hear about in Second Corinthians. This new reconciliation guide bases our examination of conscience on the seven deadly sins: pride, envy, greed, gluttony, lust, anger and sloth. Father Horn reminded us that these sins always lead us to isolation from Christ and one another. Living in isolation then leads to “bad fruit” — immorality, impurity … idolatry, sorcery, hatreds, rivalry, jealousy, outbursts of fury, acts of selfishness, dissensions, fractions, occasions of envy … and the like” (Gal 5:19-21). The guide suggests possible penances that focus on heavenly virtues which lead us out of isolation and into communion with Christ: humility/loving obedience, kindness/admiration, charity/generosity, temperament/self-control, chastity/purity, patience/forgiveness and diligence/zeal. When we are living in communion with Christ, the good “fruit of the Spirit” is born in our midst, namely “love, joy, peace, patience, kindness, generosity, faithfulness, gentleness and self-control” (Gal 4:22-23). This Advent could be a good time to use this new guide for penitents and priests, titled “Confession and Receiving God’s Mercy.” It would be a good addition to your parish’s reconciliation plan and one more resource for helping to fulfill the Diocesan Pastoral Plan. This guide is put out by the Institute for Ongoing Clergy Formation at St. Paul Seminary, St. Paul, Minnesota. I have ordered 5,000 of these guides. I know a number of parishes have already ordered them as well through the Office of Stewardship and Vocations, but if you or your parishes are interested, but have not already ordered some, please let me know and I would be happy to get them out to you. I wanted to leave you with the Act of Contrition contained in this new guide. It speaks beautifully of this desire to live a life focused on reconciliation and mercy. Lord Jesus, to know You is eternal life. I believe you are the Messiah, the Son of the Living God. I love You and I place my trust in You. I am sorry for all my sins and for withholding myself in any way from you. Please forgive me and heal any pain I have caused others. I forgive anyone who has hurt me, and I ask You to bless them. In Your name, Jesus, I renounce anything in my life that is not of You that I have welcomed into my mind or heart. Wash me in mercy and fill me with Your Precious Blood and the Holy Spirit. Father, of all my need for love and affection is found in Your embrace. May I never leave my home in Your heart again. By Your grace, I resolve to remain in Your shelter and abide in Your shade, where You restore to me the joy of Your salvation (Ps. 91, Ps.51). Amen. The March for Life began in Washington, D.C., as a small demonstration and rapidly grew to be the largest pro-life event in the world. The peaceful demonstration that has followed on the somber anniversary of Roe v. Wade every year since 1973 is a witness to the truth concerning the greatest human rights violation of our time, legalized abortion on demand. 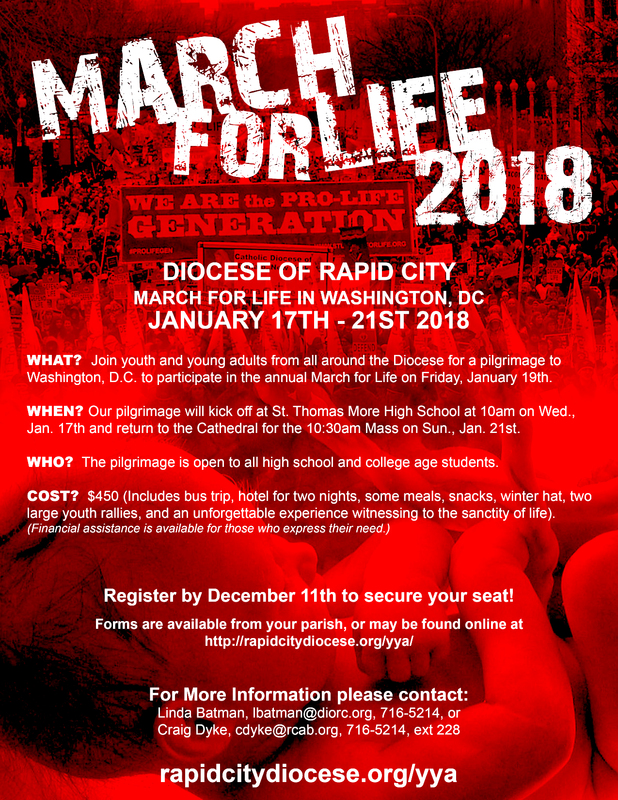 Join the Office of Youth and Young Adults for a trip to Washington D.C., to participate in the rally and March for Life on January 19, 2017! Open to all high school and college age students. Contact your parish youth minister, Linda Batman, lbatman@diorc.org, or Craig Dyke, cdyke@diorc.org, for more information. Click here for a registration form.